Task: to advertise a cloud service. People use Yandex.Disk to store all kinds of files, even those they do not normally publish in social networks. Here they can easily open them on various devices, explore, download and show them to their friends. Yandex.Disk is a perfect way to exchange lecture notes, drawings, audio recordings of lectures, photographs of fellow students, party videos and other materials vital to every student. 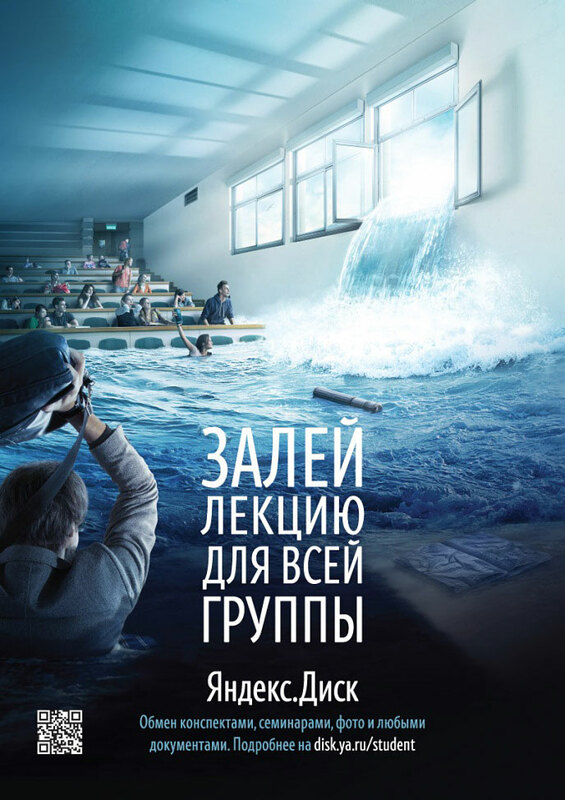 Advertising posters are hung in Russian universities. To attract additional attention to the service, we created a series of teaser ads and banners for the main page of the search engine and its partner websites. The promotional website created at the studio clearly demonstrates the main advantages of the service and explains how to start using it.